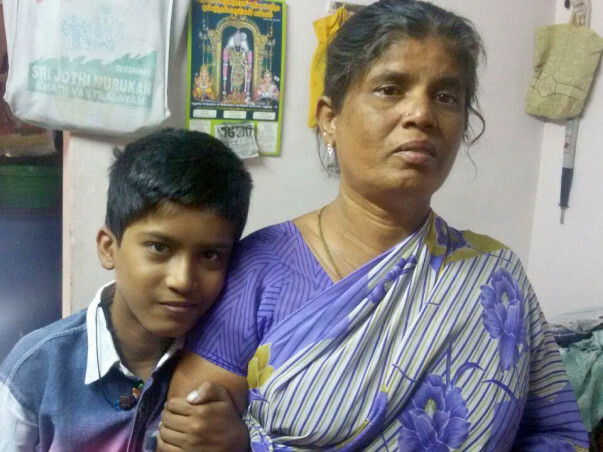 Gopi's Mother Has Lost 2 Children Before. You Can Help Her Save Him. Gopi came into our lives quite late. It had been 10 years since I had lost my first child. Then I lost a second one the same way. A complication during pregnancy. My BP would shoot up to a point where I would even lose my vision. I was 35 when I gave birth to little Gopi. He came into life like sunshine, and his the echo of his giggles echoed in my lonely house since then. 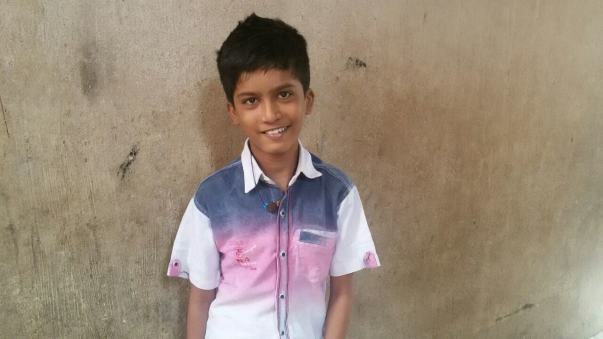 If you speak to Gopi, you wouldn’t guess he was diagnosed with a heart problem at birth. He is a fun, jovial boy who finds a bright side in everything. There is only one thing that absolutely terrifies Gopi: the hospital. 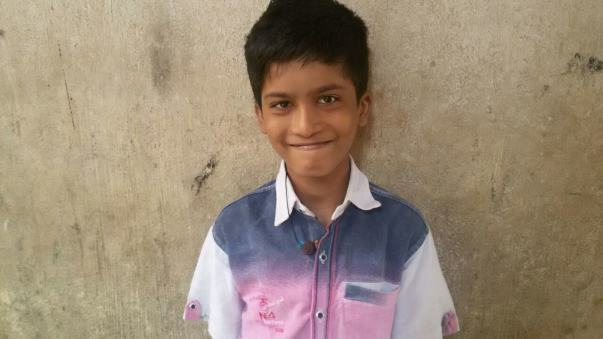 When Gopi was born, the doctor told us he has a heart problem, and a surgery would be a safe choice. My husband works as a painter. We live a life where no wages for a few days means no food. A surgery was too expensive. So we chose to regulate his condition with medicines. There was a situation recently when we had to take him to the hospital for a surgery. He was there in the hospital for 6-8 days. Then, fear took over. People in the neighbourhood started saying that surgeries are risky. We somehow pleaded with the doctors and got him a discharge before the surgery could happen. Gradually, his condition started to worsen. He will not make it if he doesn't undergo the surgery. When your 13-year-old asks you when he would go back to school, if you have as little knowledge as I do, you too would fumble. I don’t know how I can tell him he lives with a threat to his life, without scaring him. The doctors have declared that delaying the surgery after this point could take away our last chance to save my son. We must get him admitted within a week, but with absolutely no money in hand, how can we? We have nothing to sell or mortgage as well now. I cannot imagine my house go back to being that cold, silent place again. 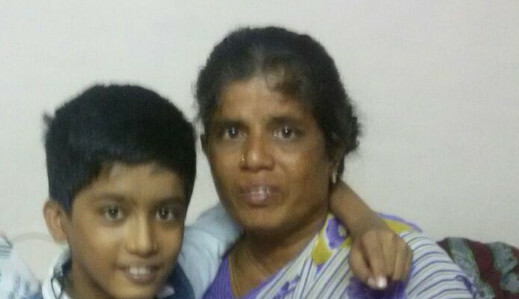 I have lost 2 children before; I cannot lose Gopi. He is all I have. Gopi believes he has a small problem, and will recover if he takes an injection. He is eagerly waiting to return home and go back to school again. You could save a mother from losing a 3rd child. Our support will save Gopinath's life. We would like to thank you for the support you have shown towards Gopinath so far. 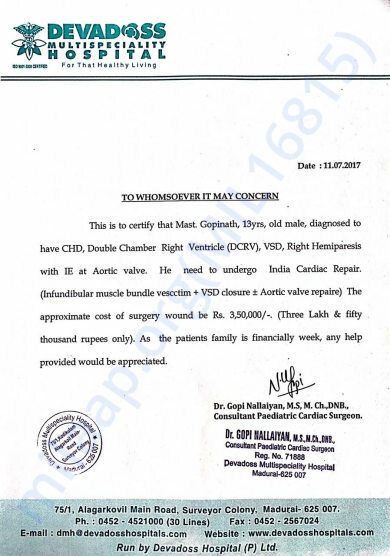 While Gopinath's surgery was due soon at Devadoss Multispecialty Hospital in Madurai, his family decided to withdraw the treatment despite multiple attempts from the hospital and the foundation to convince them otherwise. We have identified another patient, 3-year-old, Sathya, with the same condition as Gopinath, who is in need of funds for her post-surgery treatment and medication. She has undergone the surgery but her family, who come from an underprivileged background are now struggling to pay her bills and medical expenses. 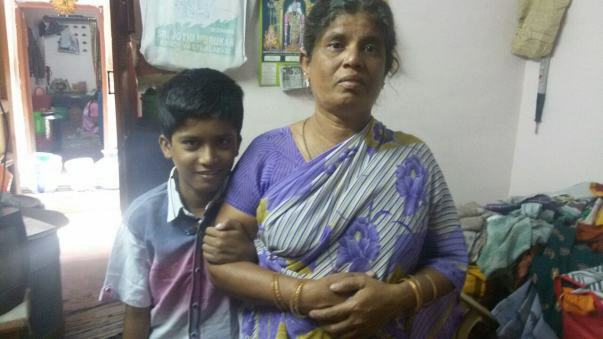 Your contribution can help Sathya recover and get back to normal. Please write to us by the 21st of November (5 days) in case of any queries post which we will transfer the funds towards Sathya's treatment. Gopinath's treatment is going on. He is currently suffering from fever because of which there has been a delay in his surgery. The doctors cannot do the surgery until his condition is absolutely stable, to avoid complications on the same. The surgery is most likely to take place on 20th October, that is if he recovers from the fever and there are no side effects. Thank you so much for the support. Please pray for his recovery.